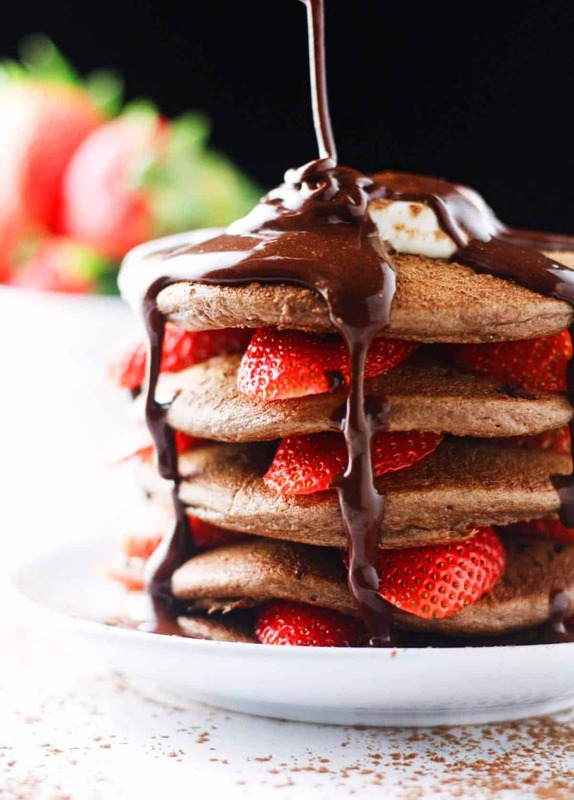 Nothing quite says “I love you” like a huge stack of Strawberry Chocolate Protein Pancakes. I mean… don’t get me wrong, a dozen puppies would be pretty hard to beat. BUT, this sweet stack comes preeeetty darn close. Do you know what? I’ve come to the conclusion that us “healthier” eaters can never really catch a break. It’s like certain holidays were placed ever so strategically on that darn calendar so that we have no choice but to indulge all year long. I mean, yeah okay we could just exercise that little thing called self control and say no to the sweet stuff all year long but TBH… that sounds exhausting. Say no to Halloween candy? Nope I’m a nanny, gotta eat all of the kids’ candy. It’s an important part of my *cough* job requirements. Okay, so how about we just skip past the Christmas candy? HA. It’s okay, I laughed too. Valentines Day? Or should I say…February 15th? (Because let’s be real, I get more excited about the 75% off chocolate sales). Then we have Easter. Oh, darn you Easter bunny. Hoppin’ around, laying those calorie filled chocolate eggs everywhere. I WILL say that this past year, I’ve done significantly better at taming my savage sweet tooth and I have protein to thank for that. Foods that are high in protein are SUPER essential to avoid over-snacking and loading up on carbs and sugar. One of the main reasons for this is because protein helps you to feel full for sustained periods of time. As an eager attempt to increase my daily protein consumption, I skipped off to Kroger and purchased a nice big tub of cottage cheese. I’ve seen all of the health nuts and fitness freaks RAVE on about it for years but for some reason, I’d never really officially jumped on the band-wagon. Come to find out…I think that all of those years were a sign. A sign that cottage cheese didn’t need to be anywhere near my mouth. Ever. That texture is something that will probably haunt me for years to come. I get little goosebumps just thinking about it. Wet…runny…AND lumpy…? (gag). I’ve even tried it with added fruits, peanut butter, salsa… still no luck. I realized that I had to find recipes that I could literally disguise this tub of lumpy protein in or throw it in the trash, so off to Google I went. And that’s when I discovered the wonders of cottage cheese pancakes. Uh HELLO. Earth to Vicci?! Where have these been all of my life? These Strawberry Chocolate Protein Pancakes contain an entire half cup of cottage cheese…and you would never even know! To amp up those pros even more, I added a scoop of chocolate protein powder. 26g of protein per serving. YES. Add the whole wheat flour, protein powder, cottage cheese, maple syrup, almond milk, eggs and baking powder to a blender and blend until smooth. Place a nonstick pan on medium heat and spray lightly with nonstick spray. Allow the pan to heat up and then pour the mixture into small rounds onto the pan. Cook on one side for approximately 3-5 minutes or until the edges can easily be lifted with a spatula. Sprinkle approx a tbs of chopped strawberries onto each pancake and flip. Cook for an additional 3-5 minutes. To serve: layer pancakes by placing a pancake on the plate then topping with sliced strawberries and repeating. In a small bowl, mix together the maple syrup and cocoa powder to make chocolate syrup and drizzle over pancakes. Enjoy! These look fabulous and I think everything good in moderation is no bad thing. Love the fresh strawberries too. I definitely agree with you that moderation is key, Kavey! Can I have these pancakes AND the dozen puppies? :D :D These sound so good! Omg, life would be COMPLETE! Oh my gosh, I forgot about the chocolate sales!!! I love to use cottage cheese in baking. But for eating by itself, I only like real whole milk cottage cheese (most cottage cheese brands have other ingredients in them), which is hard to find. Otherwise, I'm totally with you on the whole goosebumps thing. These look amazing and that chocolate drizzle has me drooling. I've never thought to try whole milk cottage cheese. Maybe if I can pluck up the courage to give it one more shot, I'll see if that one agrees with the taste buds! Great way to start the day! Chocolate pancakes and chocolate syrup, both on the lighter, healthy side!